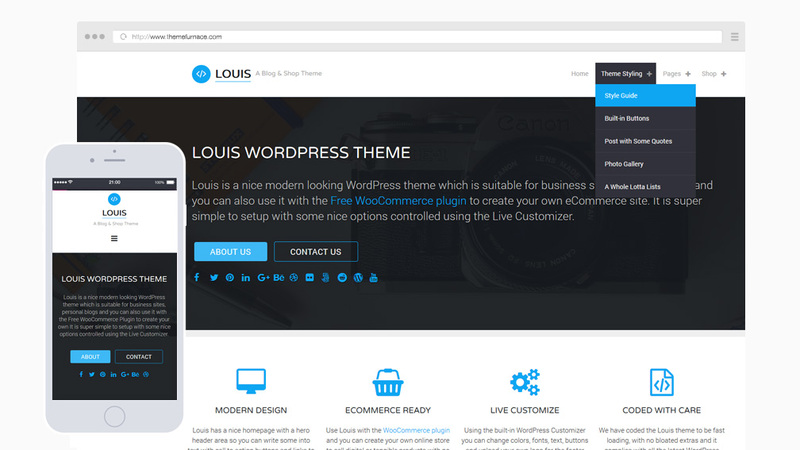 Louis is a nice modern looking WordPress theme which is suitable for business sites, personal blogs and eCommerce websites. The theme has a large header area where you can upload an image and use the tools in the Customizer to add an overlay color and set the opacity or blur the image. The header also contains space for a title, introduction text, 2 call to action buttons and a social media area where you can link to your profiles with icons. The homepage also has a featured icon area where you can add our custom features widget with any icon from FontAwesome and draw attention to features on your website. Posts are displayed in a neat grid layout and the whole theme is responsive so will scale down gracefully for smaller screens and will display a top menu for your mobile visitors. Customization is handled via the Customizer where you can change accent color, fonts, upload separate header and footer logos.